Detroit Tigers and Red Wings owner Michael Ilitch recently passed at age 87. He may be gone physically from us, but his legacy and works will keep him in sports lore. In 2011 ESPN the Magazine released its annual “Best in Sports” rankings and when it came to pro franchise owners, Ilitch was ranked #1. The rankings were reportedly based on honesty, commitment to the community and loyalty to core players. As I think of great owners in sports, two men quickly come to mind. When I was snotty-noised journalist trying to come up in L.A., surprisingly to me Al Davis (Oakland & Los Angeles Raiders) and Dr. Jerry Buss (Los Angeles Lakers) became my personal advocates and helped me gain traction in the industry, by ensuring I got inclusion, as I was transitioning from engineering to a journalism career. Any talk of great owners in sports should yield George Halas, Chicago Bears (1920-1983); Ted Turner, Atlanta Braves (1976-2007); George Steinbrenner, New York Yankees (1973-2010); Walter O’Malley, Brooklyn/L.A. Dodgers (1944-1979); Robert Kraft, New England Patriots (1994-present); Pittsburgh Steelers owners Art Rooney and son (1933-present), Dan, who took over in 2003 and was the linchpin for the “Rooney Rule, and finally my guys Buss and Davis. All these men were winners and understood continuity, their athletes and each sieged the moment in front them. To Ilitch’s credit he tried to siege the moment in front of him during his ownership, not sparing anything, including money, to put both his Tigers and Red Wings in positions to win. But what puts him up in the top rung of owners is his commitment to the community and the actions he took to make Detroit a better city. A few years back I wrote a column beseeching, cajoling Detroit’s movers and shakers to seek to make the Motor City a national sports entertainment district. In my 29-years as a journalist, one of the most amazing transformations I have seen is the cities of San Antonio and Indianapolis. Both were little towns with nothing going on in their downtown, each had minimal restaurants, hotels and entertainments venues. However both San Antonio and Indianapolis built basketball and football venues and all the hotels and entertainment facilities soon followed. I think Ilitch saw what I saw in those two smaller cities that were both seeking to define themselves. Each city recognized and acknowledged the walkable sports entertainment future direction and took massive steps to regenerate themselves in that genre. Building basketball, football and baseball facilities in downtown have worked for both San Antonio and Indianapolis and each city have seen their downtown explode. Unfortunately Ilitch did not live to see his Little Caesars Arena open. But he can take refuge in the fact that unlike San Antonio and Indianapolis, Motown has all four professional sports franchises, and, they are in walking distance from each other. Ilitch in his plans for the Detroit District has committed to not only a new basketball and hockey arena, but the redevelopment plans include a posh hotel, medical center, retail shops and residential housing. Indeed Ilitch believed that a sports and walkable entertainment district would collectively help Detroit’s renovation and place the city in rotation for hosting the mega-sporting events like the Final Four, Super Bowl, NBA All-Star Weekend and many other sports and entertainment events. Maybe, just maybe the addition of Little Caesars Arena could be the linchpin that will even further thrust Detroit into the sports entertainment rotation of major sporting events. The Motor City is the only cold weather city to host two Super Bowls, and, it has also recently been host to the Final Four and Major League Baseball All-Star Game. With the new arena the NBA and NHL All-Star Games are sure to make their way here. Ilitch’s commitment to Detroit is noteworthy. Not only has it been sports, but he showed where his heart is attached when he and his wife, Marian, took a chance on the historic but neglected Fox Theatre when they purchased it in 1987. They restored the 5,000-seat theatre built in 1928 to its original splendor. It did not stop there as the Ilitches commissioned an extraordinary renovation of the adjacent 10-story Fox office building in 1989, relocating its suburban offices staff, and established a world headquarters for their Pizza Company and Olympia Entertainment, Inc. in the transformed office building. Since then, the theatre district has seen a rebirth marked by the opening of other restored theatres and new restaurants, and the building of two side-by-side stadiums for the Detroit Tigers and Lions. In all the Ilitches own Little Caesar Pizza, Olympia Entertainment, Olympia Development, Champion Foods, Blue Line Foodservice Distribution, Little Caesars Pizza Kit Fundraising Program and the Detroit Red Wings, Detroit Tigers, as well as, the Motor City Casino. Mike Ilitch may have transitioned to the afterlife, but his life’s works here in Detroit will live on and on and on and on. ANN ARBOR – As has been the case all season with the Michigan Wolverines, they put up a gallant fight but came up short. Again, before 113,511 in the storied Michigan “Big House” Stadium, the Wolverines put up a fight until the last few seconds of the game, before succumbing to the No. 3 ranked and still undefeated Ohio State Buckeyes, 42-41. Talking to many of my friends in the press box just before the game commenced, most were speculating that Ohio State, a 16-point favorite, would blow Michigan out. And who could protest, squabble or argue with that assumption, based on the way the Wolverines have played the past seven weeks. The 2013 season started with so much hope with quarterback Devin Gardner starting his first full season at the helm of this Michigan team. Living up to those expectations, the Wolverines started out 5-0. However, after a four overtime loss in a game they should have won, UM has descended downward. After the Penn State heart breaker, over the next seven games Michigan forgot how to block for the run, protect for their quarterback (Gardner), and, defend against the run defensively. That Penn State loss has been followed with a beat-down by Michigan State, two close very winnable games against Nebraska and Iowa, and now this. Coach Hoke, Gardner and the entire Michigan team all said that this was enough, and, collectively they went after a win on Saturday. After trailing 35-21 in the fourth quarter, the Wolverines showed some fighting spirit and grit. Coming back time after time, eventually tying the game at 35-35 with a little more than five minutes left in the contest, only to see OSU fly down the field to take a 42-35 lead with 2:20 left in the game. For Gardner and his teammates this was an opportunity to arrest all the football demons that have been causing them grief. With purpose and determination the Wolverines sat sail on an 11-play, 84-yard drive that gave them an opportunity to tie the game. Indeed in was the best thing, the only problem was the play UM called in their most crucial possession of the season. So Michigan went for the 2-point conversion and Ohio State (12-0, 8-0) remains undefeated. With the win the Buckeyes achieved their 24th consecutive victory and keep their national championship hopes alive. 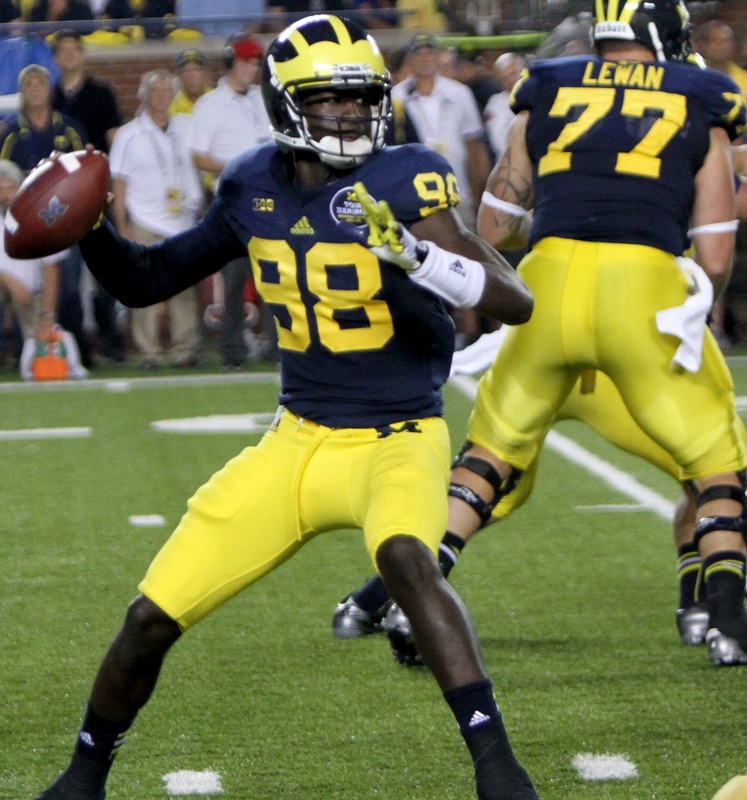 Gardner put in as good an effort as any UM quarterback versus OSU. He completed 32 of 45 passes for 451 yards and four TDs, connecting nine times for 175 yards and a score to Jeremy Gallon, and he ran for a 1-yard touchdown that gave Michigan the first lead in the shootout that went to halftime tied at 21. The near Michigan upset almost gave the Wolverines (7-5, 3-5) their biggest upset in one of America’s greatest rivalries since legendary coach Bo Schembechler‘s first team at Michigan beat what Woody Hayes noted was his best Buckeyes squad ever. The loss was yet another in Gardner’s first tenure at the helm of the Wolverines. He has showed that he is a skilled athlete and field leader, but the problems on the offensive line and in the running game knocked him off the pedestal as a premiere quarterback in the country. Proposed Ilitch Downtown Detroit arena could be linchpin for area. Ford Field hosted Super Bowl and Comerica hosted MLB All-Star Weekend. 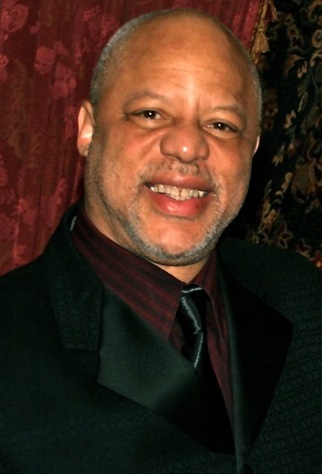 Wake up Detroit movers and shakers! This is a crucial time that calls for bold moves and long-term vision, not only for Detroit, Michigan’s largest city, but the entire state. Now that the Ilitch organization has finally put it out on the table their vision for building a new entertainment district downtown anchored by a multipurpose arena that would be home to the Ilitch-owned Red Wings, and hopefully the Pistons, I say make it happen with the quickness. As Detroit continues to dig itself out of the economic disaster of 2007 that sent the city, state, country and the auto industry on a precarious and uncertain future, this proposed venue would give the Motor City an enormous shot in the arm. All of Detroit leaders need to look at transformation Indianapolis and San Antonio undergone. Two smaller cities that were both seeking to define themselves. Each city recognized and acknowledged the future and regenerated themselves as sports entertainment venues. Indeed sports and walkable entertainment collectively is the new model to ensure a city’s rotation in hosting the mega-sporting events like the Final Four, Super Bowl, NBA All-Star Weekend and many other sports and entertainment events. Sure there are those that will Detroit’s finances, the many vacant homes, and the continued Urban American homicides. Distracters will talk about the neighborhoods needing special attention and rightfully so. However, the dynamics of inner cities in America is a national problem of economics, employment, shifting population, and old infrastructure. But one problem is no reason to hold up another potential uplift. If indeed the proposed multipurpose arena is commenced, it would not only host hockey and basketball, it would host a range of shows, concerts and other events, while the broader district would include residential housing, retail shopping, office space and more. What more needs to be said? The City Council, Mayor’s Office, and state government needs to all get on board and help turn this vision into a reality. I have been to both San Antonio and Indianapolis and seen how the new model of building all their sports venues in a walkable proximity. In conjunction with the arenas and stadiums hotels, eateries and housing have evolved. Take the Los Angeles Staples Center for example. I was in LA when the developers started building the arena and many said who will perform there and that it was a waste of money and resources. Well, the Lakers and Clippers and Kings after seeing the venue quickly abandon their arenas. The Staples Center has galvanized a three block district called LA Live that has clubs, restaurants, theaters and hotels. The LA downtown area before the Staples Center and LA Live was built was a waste land of poverty. A number of cities have shown us how a city came use the sports entertainment model to regalvanize a downtown and city. An Ilitch family’s Olympia Development news release quoted George W. Jackson Jr., the city’s top development official and president and CEO of the Detroit Economic Growth Corp., as saying the plan “makes good” business sense. The Ilitch organization pegged the probable price tag at $650 million. Legislation introduced in Lansing would create a new “catalyst development project” that could benefit from support from the Michigan Strategic Fund and also from the use of Downtown Development Authority tax revenues that support projects in the central business district. I too had this vision. So let’s keep it moving Detroit. Detroiter’s stock rising in NFL circles. EAST LANSING – With ESPN College GameDay crew creating the hype on Michigan State University’s campus and an ESPN national television audience looking on, former Detroit Public School League (PSL) star Johnathan Hankins and his Ohio State Buckeyes outlasted MSU at Spartan Stadium, 17-16 in the Big Ten opener for both teams. As I headed to the post-game interview area, I ran across former Detroit Southeastern High coach Donshell English. He had arguably two of the best defensive linemen in PSL history on a team that finished 11-1. Both Hankins and MSU’s William Gholston made All-State and were on the Michigan Chronicle ALL-PSL team. The 6-foot-7, 278 pound Gholston left the PSL the No. 1 ranked player in the state and the 6-foot3, 322 pound Hankins was the 20th. Now Hankins and Gholston, both juniors, are ranked as the best two defensive players in the Big Ten and both are pre-season All-America picks. Recently Big Ten Network NFL draft expert Russ Lande’s weekly Big Board, flip-flopped Gholston and Hankins, making the Ohio State defensive tackle Hankins the No. 1 player in the conference, with Gholston No. 2. English said he is not surprised that both his star players at Southeastern have continued to grow as students and athletes. About Hankins English recalled: “Against MSU he was a force from the very first play of the game controlling the middle. You can tell the way his coach (Urban Meyer) and his teammates respond to him, he is a team leader. With Gholston being an early commit with the Spartans, and Archie Collins, Southeastern’s defensive coordinator during those seasons, a graduate assistant with Michigan State, it would seem Hankins and Gholston would have ended up together in East Lansing. Hankins said that although the Buckeyes are on probation and will not be able to play for a Big Ten or national title, Meyer still has his team motivated and striving to be the best they can be. When Meyer arrived this season, Hankins quickly showed him he was the type of athletic defensive tackle that could be the anchor of his defense. He is fast becoming noted around the country for his running back feet, a big smile and a nose for the ball that proves he is more than just a big body. ANN ARBOR – Obviously this was litmus test for the University Michigan Wolverines, as they undertook their first home game of the 2102 season versus the running instead of flying Air Force Falcons. Before 112,522 in the Big House the only thing that took flight for the Falcons was the jet flyover that took place after the nation anthem was concluded. These groups of flyboys really are as run happy a team as there is in college football. Air Force grounded out 400 yards in its first game and pushed the Wolverines around enough to the tune of 290 rushing yards. Still the hungry Wolverines hung on and chewed up the Falcons through the air and on the ground for a hard fought 31-25 victory. Leading the way was Wolverine quarterback Denard Robinson, who combined for 426 yards (218 rush, 208 pass), accounting for all but seven of Michigan’s entire offensive output. Helping Robinson out were junior quarterback-turned-receiver Devin Gardner and freshman tight end Devin Funchess. Funchess had four catches for 106 yards and a noteworthy 30-yard touchdown where he out-jumped a defender. He was the first Michigan tight end to top 100 yards since Jerame Tuman had 126 against Colorado in 1997. However, Gardner was the most comfortable target for the second straight week, catching five passes for 63 yards, including a precision route for his score. Against Alabama Gardner latched onto a 44-yard touchdown pass, showing all his potential. Last week the Wolverines took on defending national champion and then second-ranked Alabama. The Crimson Tide put such a beating on the Wolverines that they were elevated to the top-ranked team in the country while the Wolverines sunk from No. 8 to 19. During the fall of 2009, Gardner was rated as the No. 1 dual-threat high school quarterback in the United States by Rivals.com and the No. 5 quarterback by ESPNU. He verbally committed to the University of Michigan’s 2010 recruiting class in the spring of 2009 and enrolled at the University of Michigan in January 2010. Much to his chagrin Robinson was entrenched as the Michigan quarterback and during spring practice Gardner made the switch to receiver. The question I asked Gardner is he now a receiver or a quarterback? As for now Gardner is turning into the most stable receiver on the UM team. They play Massachusetts this Saturday at the Big House and it is an important test for keeping this team on track. 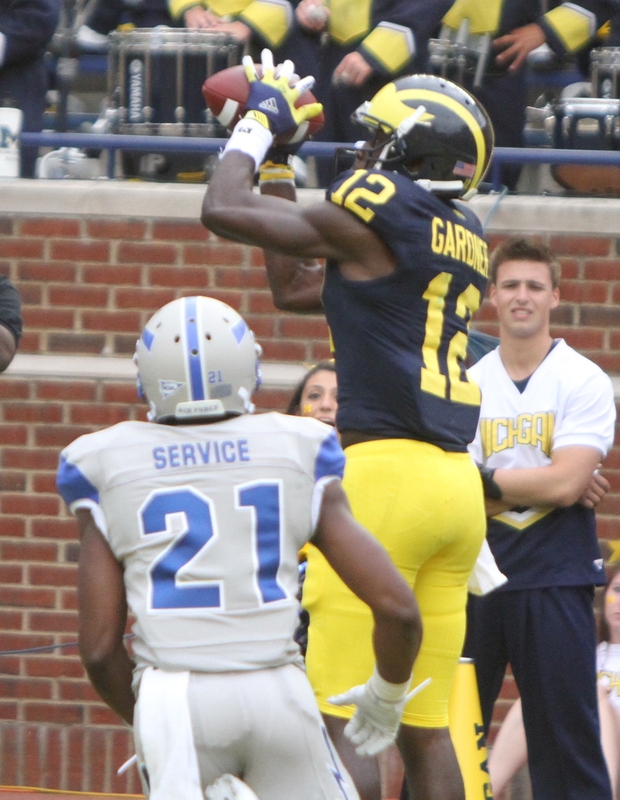 Gardner, 6-foot-4, is proving to be a key clog in the Wolverines passing game.